Chapter Three excerpted from Ozma of Oz, 1907. Originally published in the Philadelphia Public Ledger, June 10, 1917. 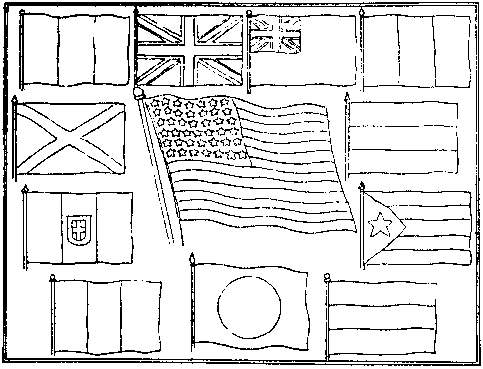 Mr. G. Ography was much surprised to find how many grown-up folks did not recognize the flags of our ALLIES. He said he was sure the boys and girls would, and I am sure, too. Write the country beneath the flag and put in the colors in crayon or paints. Mail to Mr. G. Ography, and for every correct one there will be a prize. The authors and poets which completed the Forgetful Poet's verses were Mark Twain, Hall Crain, Eugene Field, Grimm and Burns.